**GIVEAWAY NOW CLOSED. Winner has been selected and emailed: Regina H.
Today is a very exciting day for you on Chef in Training. You get a review, recipe AND a giveaway!!! I was SUPER excited when Duncan Hines reached out to me about reviewing their new “Frosting Creations” flavor mix ins. For the month of March ONLY, Duncan Hines has 4 NEW and exciting “Frosting Creations” mix in flavors. These flavors include “Key Lime Pie”, “Fruit Punch”, “Pink Lemonade” and “Peaches and Creme.” You definitely need to take advantage of these limited time flavors before they are gone. Simply pour the flavor mix in packet into the frosting starter and stir it up until its evenly mixed. Easy-peasy, right?! The flavors are absolutely delicious, you are going to LOVE them! The Duncan Hines “Peaches and Creme” flavor mix in stood out to me first because Peach Cobbler is one of my favorite recipes ever. I knew I wanted to incorporate similar flavors and compliment it with the “Peaches and Creme” frosting. I made these for my family and the DEVOURED them! Now are you ready for the Sweet Treats Giveaway?! For more information, recipes and coupons for Duncan Hines “Frosting Creations”, be sure and check out their “Frosting Creations” portion of their site. Also be sure and visit Duncan Hines on Facebook, Twitter, Pinterest and the Duncan Hines Baker’s Club to keep up with their latest products and recipes. Disclosure: I was compensated by Duncan Hines and provided Duncan Hines products for this post, but all opinions, pictures and text are my own. I am ecxited to try the key lime flavor. These look amazing! The possibilities are endless! I'd love to try the pumpkin or cinnamon flavor-- or all of them! Oh that peaches and cream sounds awesome! I think my kids would love the lemonade flavor!! Peaches and cream would be my pick! lemonade or peaches & cream! I can't wait to try the Key Lime flavor! I would love to try the peaches and creme! Definitely excited to try pink lemonade! With summer coming I've been craving that this week!! The key lime pie sounds amazing! I would love to make the pink lemonade pops for my daughter's 2nd birthday! Key lime for sure! Yum! I would love to try the pink lemonade flavor. Sounds yummy. They all sound yummy and refreshing for Spring! I'm excited to try the peach flavor! I've never been able to make a decent one from scratch! key lime!!!! especially on this snowy day! I think the pink lemonade flavor looks delicious! Thank you so much for the giveaway. I love your blog as well. I know that anything that you post, I will want to try! Peaches and Cream!!! I want to try the recipe you posted!!! Interesting flavors!! I would love to try the pumpkin!! I think the pink lemonade one sounds perfect for summer coming up! I think the peaches and cream sounds delish! I am pumped for all of the flavors, but the pink lemonade one will have to be the first one I try. peaches are my favorite so I would love to try peaches & cream! It would have to be key lime, I am a sucker for anything lemon or lime in form of dessert! I would love to try the lemonade. My kids would love it!! KEY LIME PIE....I am a lime freak! YUM! 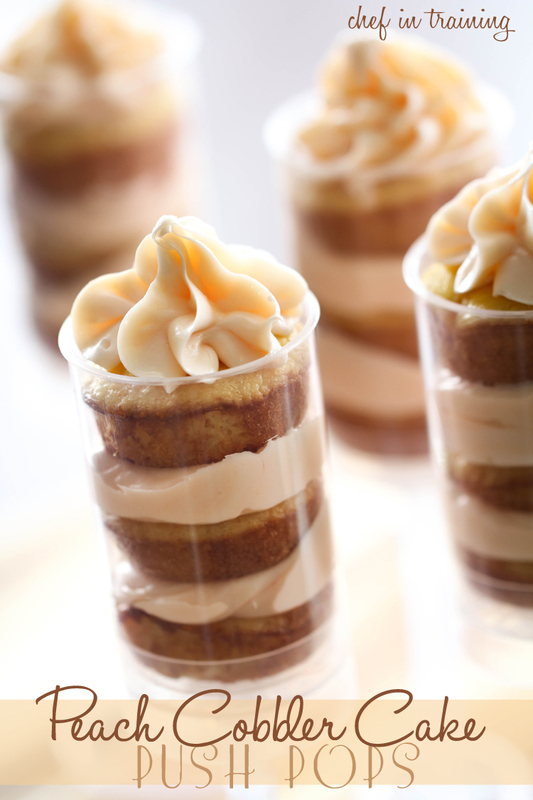 I haven't tried these frostings yet but the peaches and creme sounds SO GOOD!!! Love looking at your wonderful recipies!! I would be interested in trying the fruit punch or pink lemonade. Great Giveaway! I really want to try the peaches and cream. I've been wondering about these! I can't wait to give them a try! Wow!! I love your ideas! And I was just telling my daughter we needed to somehow create pink lemonade frosting for our summer cupcakes!! Yea!! I hope I win! key lime sounds yummy! That's my favorite flavor of all time! wow what great looking flavors!!! I think lemonade would be really good! WOW, that is really cute, can't wait to try some of these favors, have not used them before ;-) . . . . Thanks so much ! ! ! ! Ooh the Key Lime sounds yumm! I've tried the Mint Chocolate flavor before. We really liked it. Can't wait to try these new flavors. I've never seen those "cake push pops" before! How fun are they!? PS- I think the peaches and cream would be the best! So exciting! 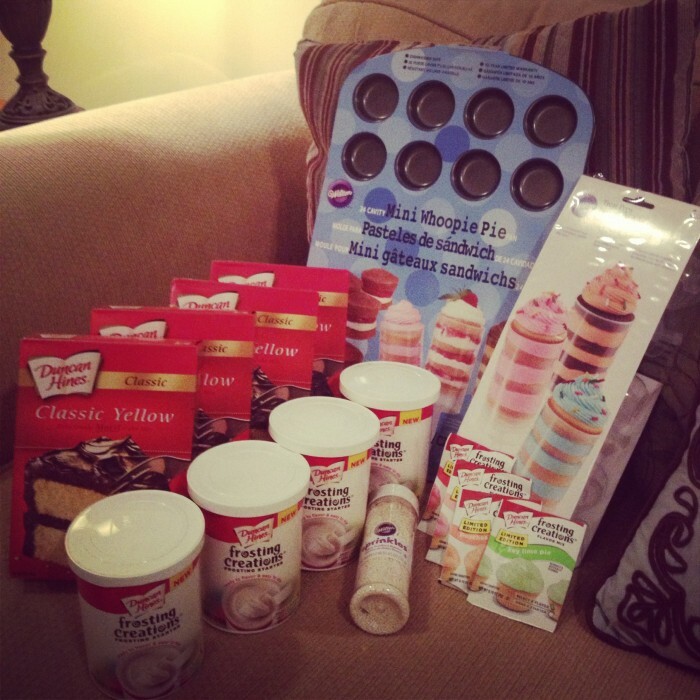 I'd love to make pink lemonade cupcakes using the frosting creations! Wow, for sure peaches....nom nom. Key Lime Pie - one of my most favorite desserts, so I want to try this in a cupcake! The peach flavor sounds divine. I love this!!! I would love to try the cinnamon flavored mix in. Awesome giveaway! I would love to try all the flavors, but the peaches and creme sounds the best! These are perfect! I love the look of them and think they would be perfect for a bridal shower or girls night out party! I would like to try the pumpkin or the peaches and cream!! I am excited to try out Fruit Punch the most! I really want to give the Key Lime a try. With St. Patty's day coming up it's the perfectt addition to a green dessert! That pink lemonade mix in looks sooo good. Would love to make double pink lemonade cupcakes with it! They all sound good, but the key lime and the peaches and cream stand out. Can't wait to try the Peaches & Cream...with this recipe! I have been wanting to make these push pop treats for a few weeks now!! Peach cobbler is a great idea! I really would love to try the frosting creations, especially the limited edition flavors!! I think the Peaches & Cream frosting sounds really unique and yummy! I would love to try the peaches and creme flavor. I am most excited to try the Key Lime flavor. The pink lemonade sounds delicous! Yum!! Tried the strawberry shortcake flavor and had to throw it out it was so bad. Super fake flavors, maybe the others are better. I'm excited to try out Fruit Punch! I want to try the Key Lime flavor!! I think the peaches and cream sounds great!!! I would love to try the Fruit Punch!! These flavors all sound amazing! I'd like to try pink lemonade first. Thanks for the giveaway! 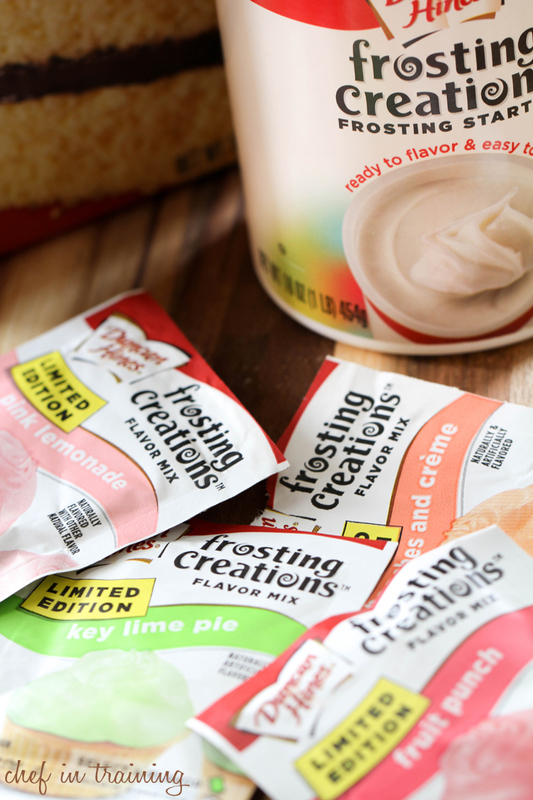 I have been a bit wary about store brought frosting, but I think these flavors sound awesome! Peaches and creme!! I'm definitely most excited to try the key lime! Wow - creative recipe! I didn't even know you could make pushpops, let alone out of cake! I am excited to try them all! I think key lime sounds awesome! The peaches and cream sounds really yummy! oh that looks super yummy! I think i would like to try the pink lemonade flavor! They all sound yummy - the key lime flavor has me the most intrigued! Im most excited to try out the key lime! The pink lemonade sounds so fun for summer! The Key Lime flavor sounds really interesting! I can't wait to try the pink lemonade! Peaches and creme sounds devine!! I'm excited to try the key lime! I'm excited to try the Peaches & Cream flavor! I am so excited to try the key lime flavor! I would love the Pink Lemonade! I want to try key lime pie! Peach- my favorite. Thanks for the recipe and the opportunity to win! I want to try the peaches and cream. mmm...I love anything with peaches! The peaches and creme sounds delightful, just like summertime!! Weirdly, I want to try the fruit punch. Sounds different! Ooh! Those all look delicious. I'd be excited to try the new Fruit Punch. But the Peaches and Creme sounds so good too! I love baking with Duncan Hines cake mixes! Pink Lemonade sounds pretty awesome! I think I'd pair it with my margarita cupcakes. I'd love to try the Pink Lemonade!! These push pops look great. Great giveaway! 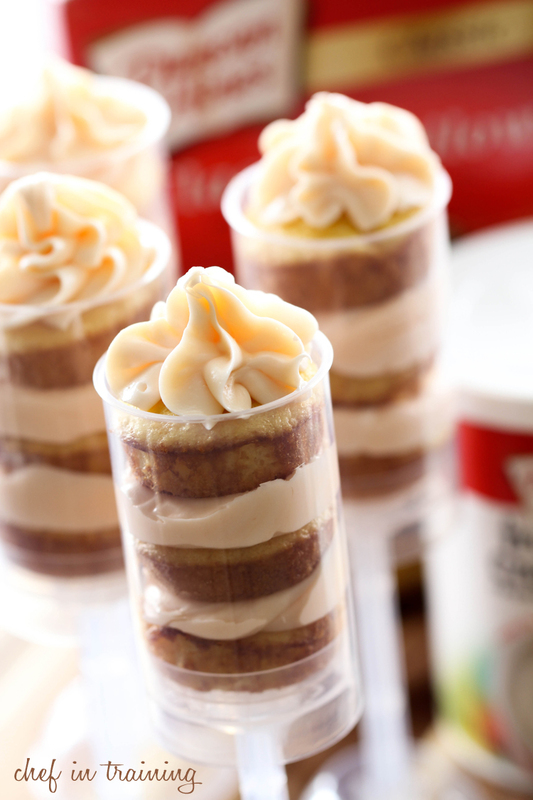 Love this recipe and the Wilton mini whoopie pan! btw - love the peach and key lime flavors! I am excited about the Pink Lemonade! They all sound delicious, but my favorite would have to be the Peaches and Creme one. I love peaches!! Never have tried these, but they sound like my kind of frosting!! Would love to win this and make some treats for my family for spring!! Pink Lemonade! They all sound tasty! I want to try the pink lemonade and I love this giveaway, hope I can win it. Thank you for sponsoring! The Peaches & Cream sounds so wonderful...makes me long for warmer weather! I have yet to use my cake push pops. How do you eat the items. Seems like he cakes would fall out while trying to eat them! First I'm going to try the key lime pie flavor in some cake balls/cake pops (since I don't have the push pop/whoopie pie supplies....yet!). They will be a great way to welcome in Spring! And then I want to try the pink lemonade for a Summer cake ball/cake pop edition! i would LOVE to try peach!! What a great giveaway.!! I would try the key lime first. I love how you used the push pops. So cute!! I can't wait to try the Pink Lemonade...yum!!! cannot wait to try the pink lemonade, it is one of my favorite things. I am torn between key lime and peaches and cream; I might have to try both! I would love to try the Key Lime flavor! Yum! I love these frostings! I can't wait to try the peach flavor! My little grandson and I are just now starting to cook. This would be great fun as he loves the decorating part! Oh, ps, he loves lemon anything, chocolate anything for me, forgot this in my post! Being a Florida girl, I can't wait to try the "Key Lime" flavor! Yummy with peaches. Wonderful giveaway. Am excited to try with key lime. Can't wait to try the peach. These push pops look like a lot of fun!! I absolutely love that mini whoopie pie pan - never seen one before :-)! I'd love to try the Peaces and Creme! I have been wanting to try both the push pops and the frosting creations for a long time...this looks like a good way to start! I have been wanting to try these frosting creation flavors, but I only use my homemade buttercream. Has anyone use the flavors in their own icing? How did it turn out? Can't wait to try the Pink Lemonade flavor! I can't decide between the key lime and the pink lemonade. I would love to try all the new flavors, especially the key lime flavor. I think the Pink Lemonade! Key Limes sounds delicious!!! So summery! I can't wait to try peaches and creme! Key Lime Pie sounds really good. I'd love to try peaches!! I'd like to try Pink Lemonade. I heart Duncan Hines and all their fun products!!! What a cute idea to do the pushpops as peach cobbler!!! Looks so fun...would love to win and play around with the combinations!!!! Cute idea with the push-up pops!! I would be most excited to try the key lime! The all sound delicious, but the one I'm most excited to try is the pink lemonade! What a wonderful giveaway. I would love to try the peaches and cream. I don not twitter or do pinintrest, but hope my entry will still qualify. Oh, wow. The key lime flavor sounds delicious! I want to try the Key Lime. I am going to have to try these. This looks amazing. Would love to serve these at our next party! I would love to try the peaches and creme flavor, especially in your push pop recipe! I am excited to try out the Pink lemonade flavor. I can't wait to try the Key Lime flavor. Yum. I look forward to trying the Peaches and Cream, it's right up my alley! I can't wait to try these limited edition flavors! Oh my gosh! I would love to try all...I will choose the key lime first though! I'm all over that key lime flavor!! It makes me so excited for summer beach weather! I am so excited to try the Fruit Punch! the peaches and cream does sound reallly good! Those look delicious! I always love the recipes that you post! Thanks! The Peaches and Cream! I hope it is really good, I'm picky about frostings. Yay! Anything to make life easier!Awesome giveaway! Too cute! I've been wanting to try that icing out ever since I first saw it! I can't wait to try the Key Lime Pie frosting creations. I think the peaches and cream flavor sounds delicious! The strawberry shortcake flavor is great, especially on the muddy buddy recipe you made for valentines day!! It was soo good! I am excited to try the peaches and creme flavor. I can't wait to try key lime pie! Cotton candy sounds so good. I think you picked the best flavor already! The peaches and cream sounds amazing! Thanks for all you do in sharing your blog with us! They all look amazing but if I had to choose I would pick Key Lime. I used this for my daughter's birthday. I used bubble gum in white frosting. mmmm - Pink Lemonade! Reminds me of summer and the 4th of July! Thanks for all of your fun ideas! !